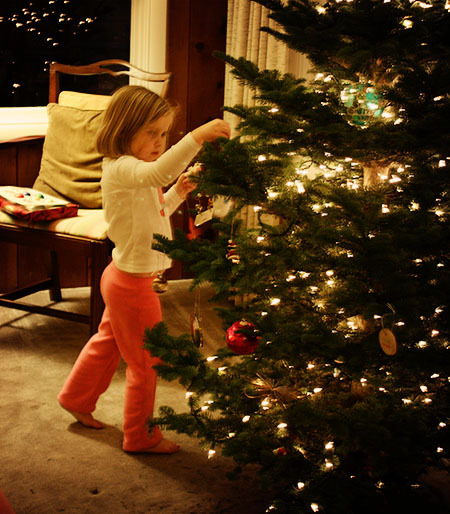 The day after Thanksgiving is my favorite day because everyone catches up and starts getting ready for Christmas! Overnight it becomes socially acceptable to listen to Christmas music, and it’s okay to deck the halls with Christmas cheer. Finally. 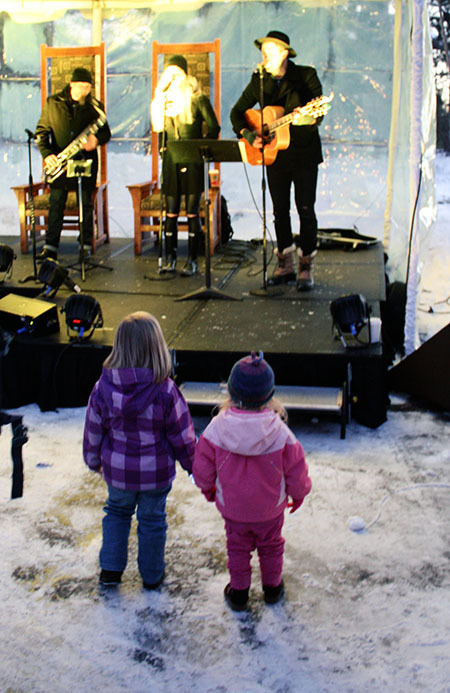 This year we went to Northern Lights again. 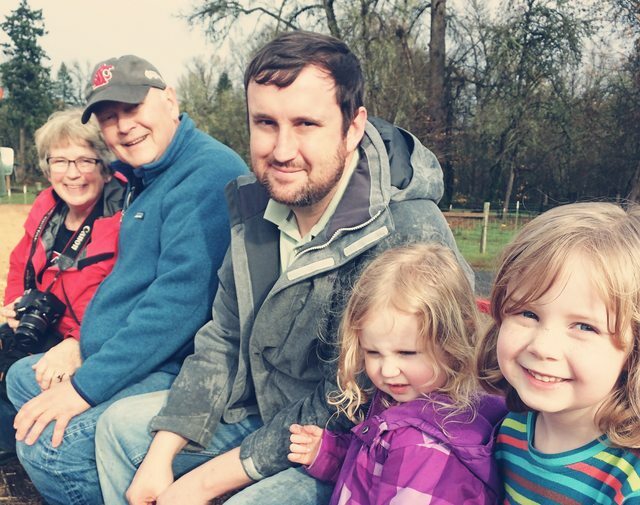 We made the trek with Jesse’s folks this year. 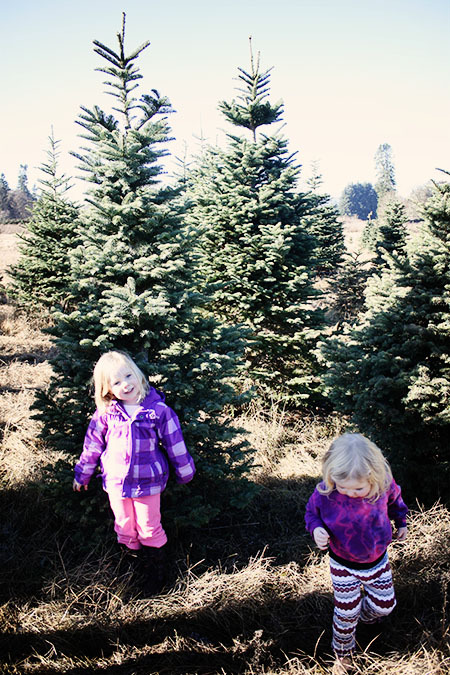 We found a perfectly lovely Fraser Fir that was tall, and sparse, and green. 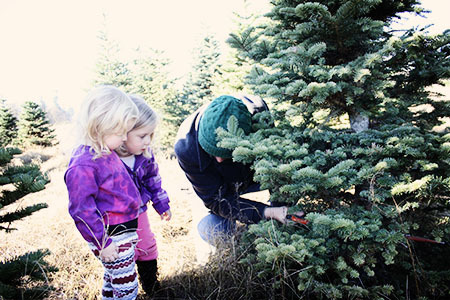 Jesse, with some help and encouragement from the girls and his dad, cut down our tree. It has a much thicker trunk than our past trees, and Jesse had to work quite hard to fall it. I love this rainy, muddy, sunny, chilly annual adventure. 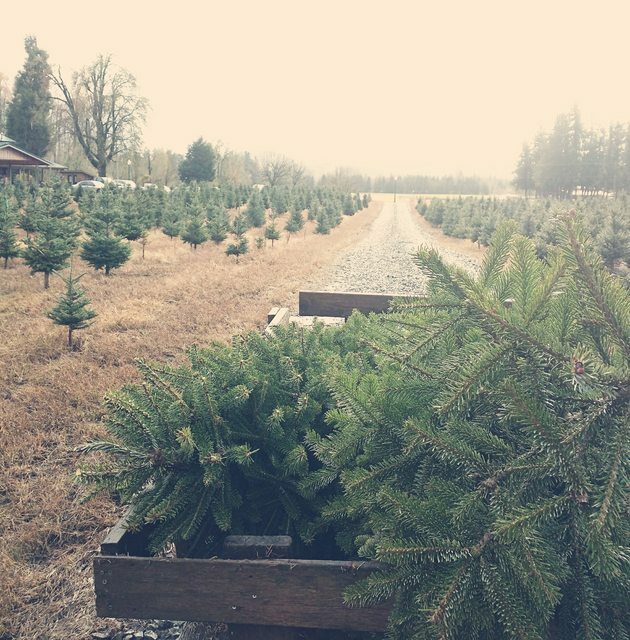 I figure that since we live in the place where most the Christmas trees are grown, it’s worth it to go to the source and get the freshest of the fresh. Because, just look at the sweet memories we are creating. Back home we got the tree all decorated. 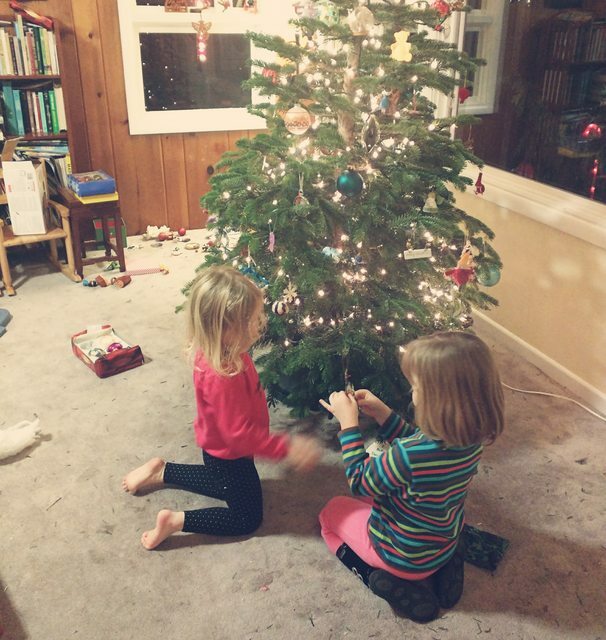 When we were done, there was a pretty solid ring of ornaments right at Harriet and Alma height. 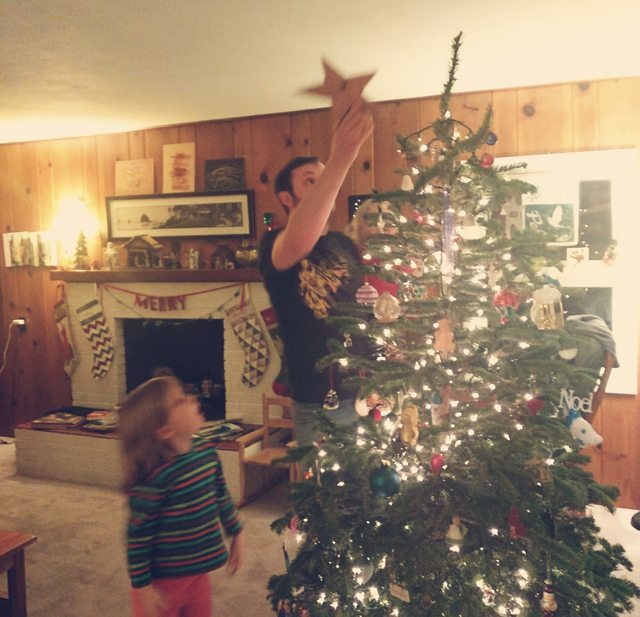 And adding the star to the top is a family affair. I love the magic of this moment, every single year. 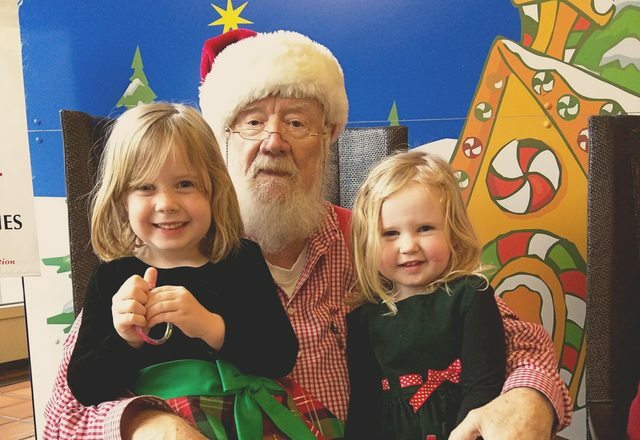 We also got to visit Santa after church on Sunday. 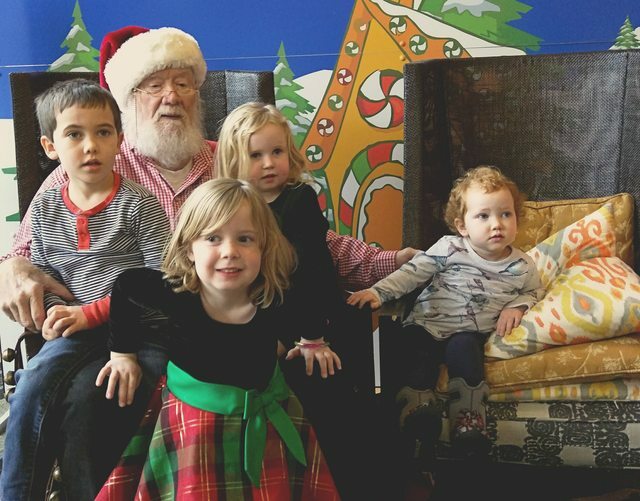 I seriously love this Santa (except that this year, he told the kids he’s just a helper… I was fully committed to teaching our kids that he was the real deal, but, whatever…). I think this was the first year both girls have happily gone right up to him and jumped into his lap. We went, of course, with Rory and Poppy. Poppy was a little unsure about the whole deal. 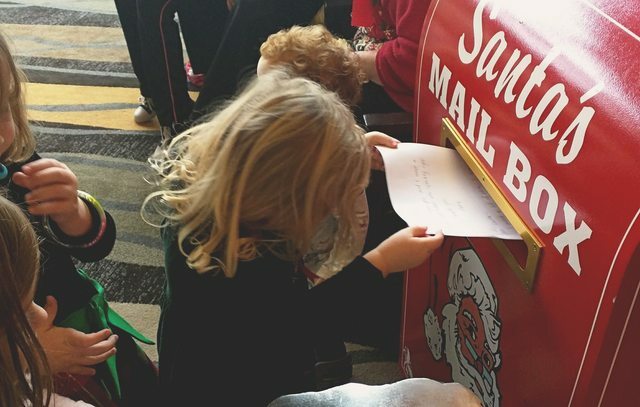 We wrote our letter to Santa and put it in the mailbox. 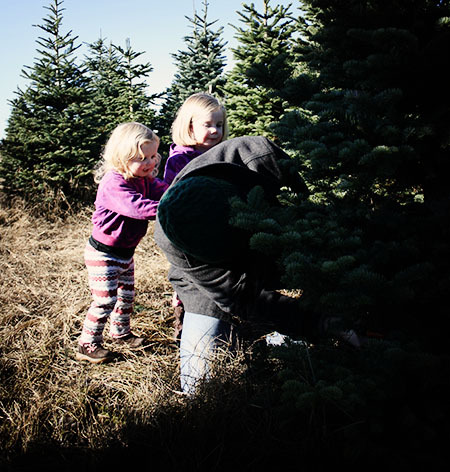 Then a talking tree – Doug Fir – came up and made us all a little uncomfortable. But, hey! It’s Christmas time! It’s Advent! Let’s be jolly! 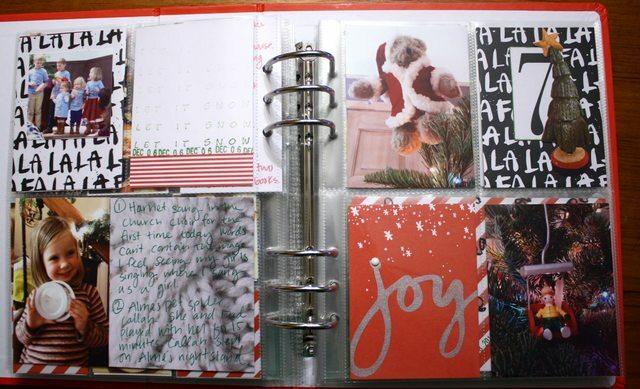 So far I have totally loved doing my December Daily. I really wasn’t sure how this would work, but I’m having fun. Usually, I pull everything out every night or two and work for a couple hours. I’m printing photos at home, so that’s a new experience. 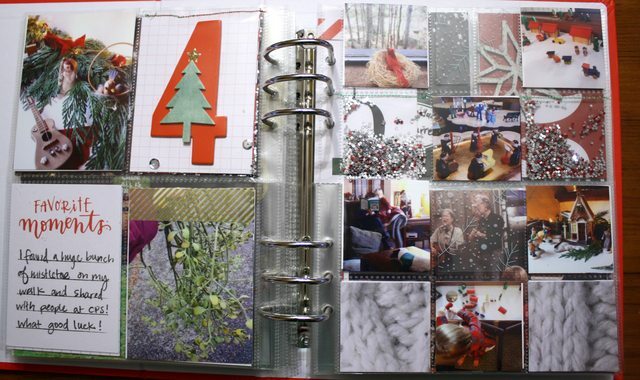 I started my book on Thanksgiving, since there is so much Christmas stuff we do that weekend. If I waited until December 1st, I wouldn’t have photos of putting up decorations, getting the tree, playing in the snow, the first Sunday of Advent. So I started on Thanksgiving. I’m not saying that these pages are done. I bet I will add to them after the month is over and I know what materials I have left over. 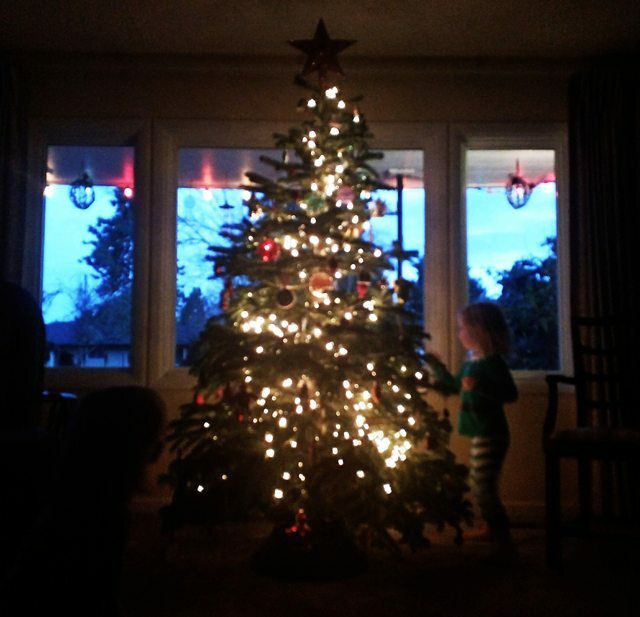 This is the spread for November 28th, when we got and decorated our tree. I love the little pockets on the right. Filling them with sequins makes my heart happy. I also like seeing through to the other sides. Here’s the 29th, you can see the back side of the little pockets. 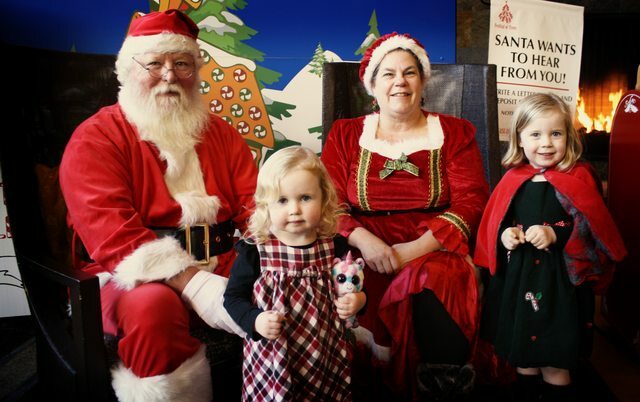 We saw Santa with some friends. The big ho ho ho page is so fun and graphic, I decided to leave it as is. The first day of December. 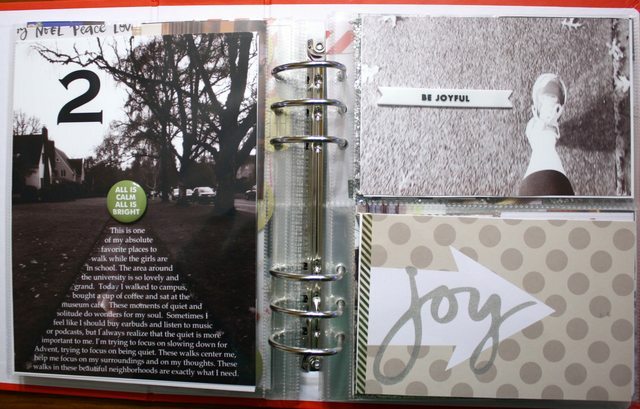 I like this spread with the black and white and little pop of green saying ALL IS CALM ALL IS BRIGHT. I get so much joy out of my calm, bright walks while the kids are in school. This is one of my favorites! We had a great time playing in the back yard and feeding the chickens. Harriet’s sense of style is on fleek these days. She’d wear that panda dress everyday if she could – and isn’t the crown with the pigtails just about perfect? 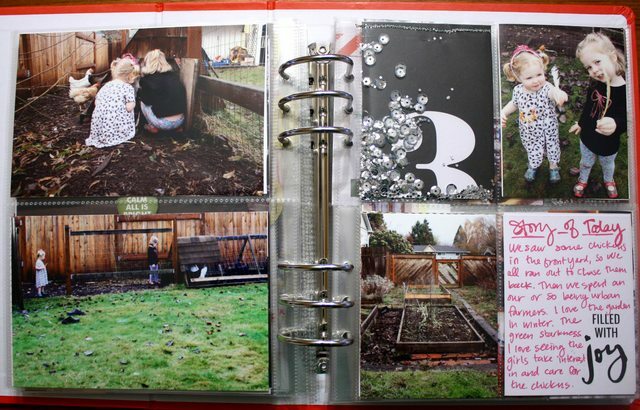 Another fun glittery pocket page! I was so amazed when I FOUND a huge ball of mistletoe in a park! I also took a bunch of photos of my mom’s Christmas decorations that have been special to me my whole life. 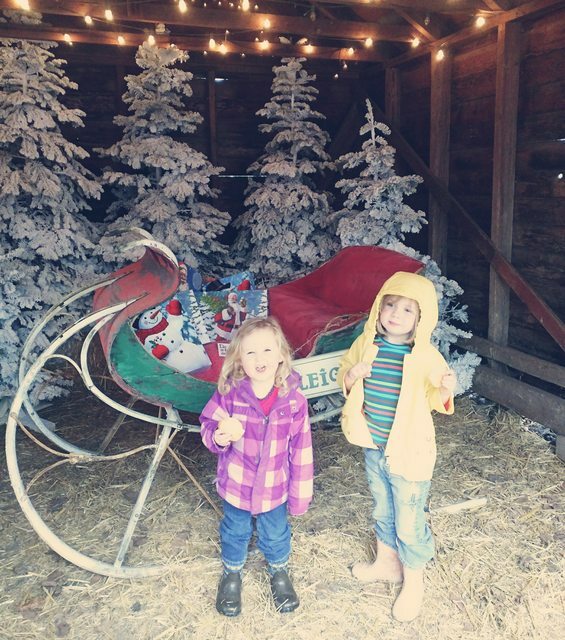 St. Nicholas Day, gingerbread house and a concert. Alma stood there and conducted the band for a few songs. Then she told me her arms were tired. This spread is two days. The 6th and 7th. Harriet sung in the church choir for the first time. Be still my heart. And if you follow me on Instagram you already know all about Callah, Alma’s pet spider. Also, decorations from my dad’s house that are meaningful to me. Here’s a little gif of all my pages so far because you know I love making gifs. First and foremost there is “Have Yourself a Merry Little Christmas” (I wrote all about my love for this perfect song two years ago). Then there are the classics, the obvious choices – “White Christmas,” “Let It Snow,” “The Christmas Song.” Then there’s always “O Holy Night” – such a lovely, simple song. But, I have some other, more eclectic favorites. Bear with me, some of these are strange, but all of them are worth it. “A Baby Changes Everything” by Faith Hill. This one was all about the timing. I first heard it when I was 9 months pregnant with Alma. 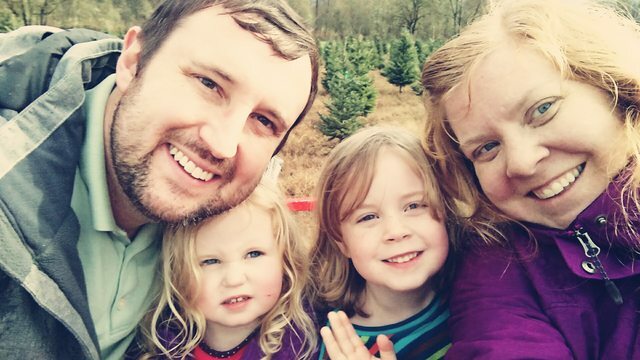 It’s slightly cheesy, but it still has a beautiful message about motherhood, and Jesus and all that. “It Won’t Be the Same This Year” by Vince Gill. This is a sad one. I don’t know why I love sad Christmas songs. We had this album when I was little, and I always loved this song. 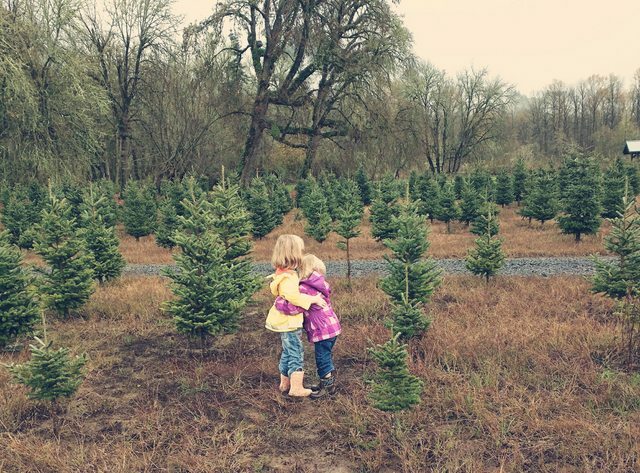 “Love is Christmas” by Sara Bareilles and by Evynne Hollens and Emily Sangdor. This is probably the most modern song on my list. I love anything by Sara. I also love everything by Evynne, so her version is perfection. 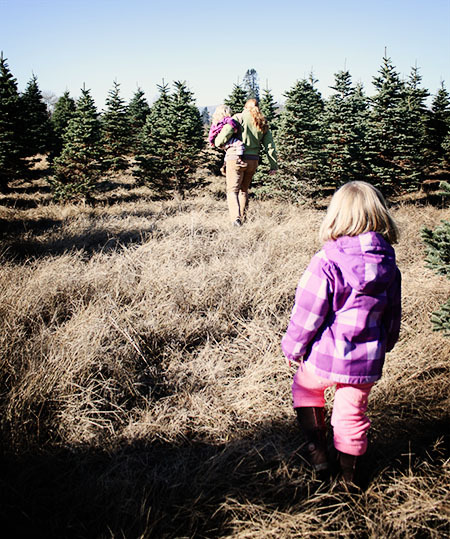 “Where Are You Christmas?” by Faith Hill (again). This one is from the Grinch movie that I have never seen. The song, though, is one of my very favorites. It’s all about hope and love and joy. What a great message to have all year, but especially at Christmas. 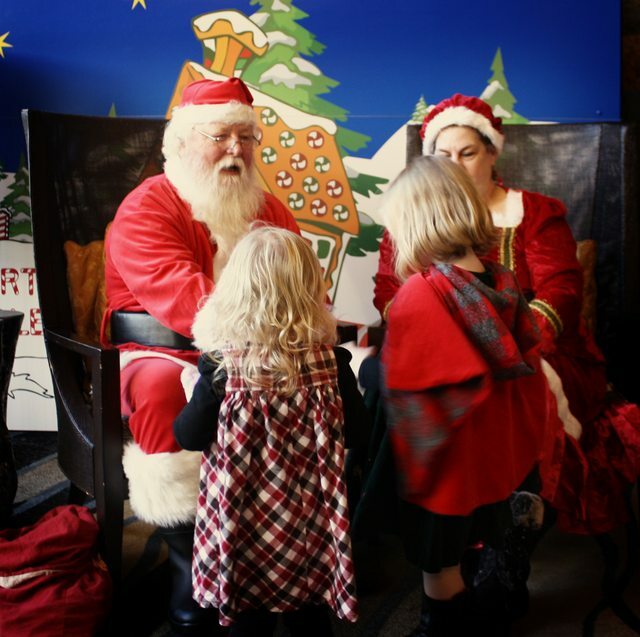 “The Man Who Would Be Santa” by Vertical Horizon. This was another song that came into my life at the right time. It was my freshman year of college. “The man who would be Santa tells his son to write, to call him if he needs him in the middle of the night, ‘don’t you worry, don’t you cry now, your mother and I love you, and think about you all the time.” This is an acoustic version on the band’s YouTube channel, but the original is also great. “Magic” by someone on an old Christmas in Sun Valley cassette tape that my brother turned into a CD. I can’t find a video of this song, but it’s great. It’s all about how Christmastime is magic. Absolutely magic. “Good King Wenceslas” by The Roaches. I love this one so much. 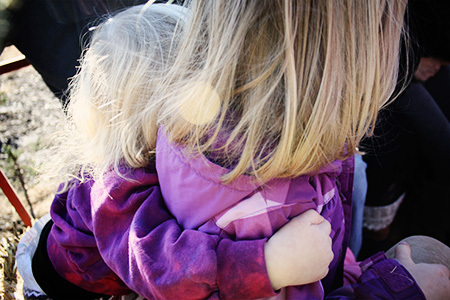 The idea of helping others, especially those who are less fortunate, is such a beautiful idea. And the fact that the Feast of Stephen is the day after Christmas is perfect. 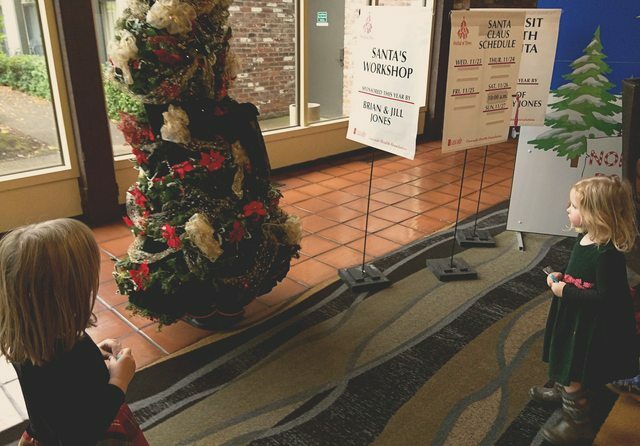 After all the craziness, it’s great to take a breath and give back. 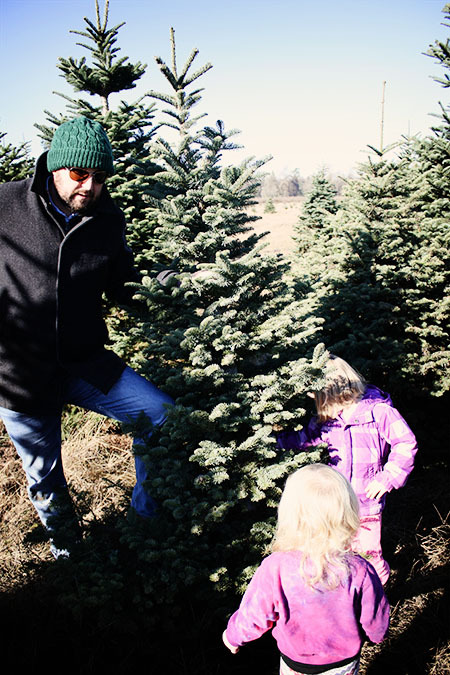 “The Cherry Tree Carol” by Peter, Paul, and Mary. I love a good story song. Peter, Paul, and Mary’s Christmas album was in heavy rotation when I was a kid. “Silent Night” all versions, but especially Cantus and the Dublinaires. “One Little Christmas Tree” by Stevie Wonder. Another song of the year. I listened to this one on repeat while we were in Azerbaijan. Christmas felt so strange there, and this song seemed especially poignant. 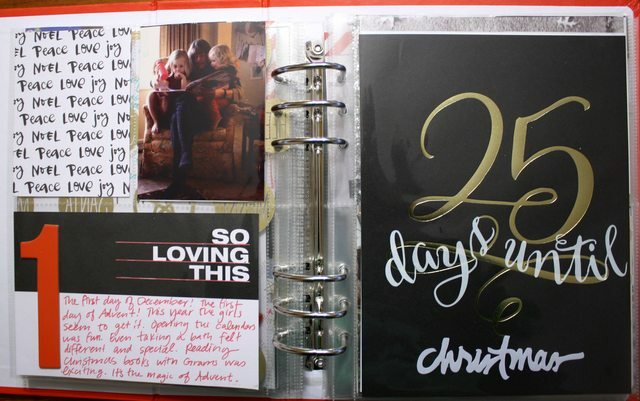 Last, but certainly not least – The entire Very Special Christmas, Volume 3 album. Especially “Christmastime” by the Smashing Pumpkins, “Oi to the World” by No Doubt, “Christmas” by Blues Traveler, “Christmas in the City” by Mary J. Blige ft. Angie Martinez, “Christmas is Now Drawing Near at Hand” by Steve Winwood, and OF COURSE “Christmas Song” by Dave Matthews. I know this is a crazy 90s flashback. I remember listening to this during my senior year of high school. If I started the Dave Matthews song right as I left school, it would end as I pulled into my driveway, every time, WITHOUT FAIL. Christmas miracles, folks. 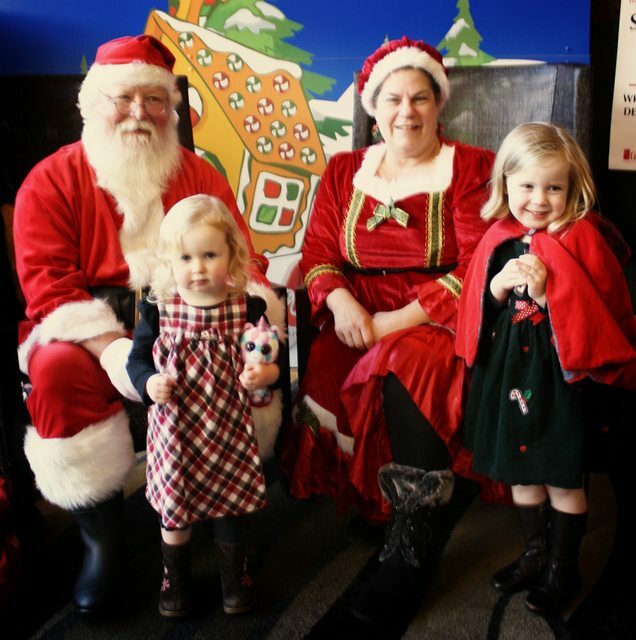 This is our fourth year visiting Santa at the Festival of Trees. It’s great to see him every year. 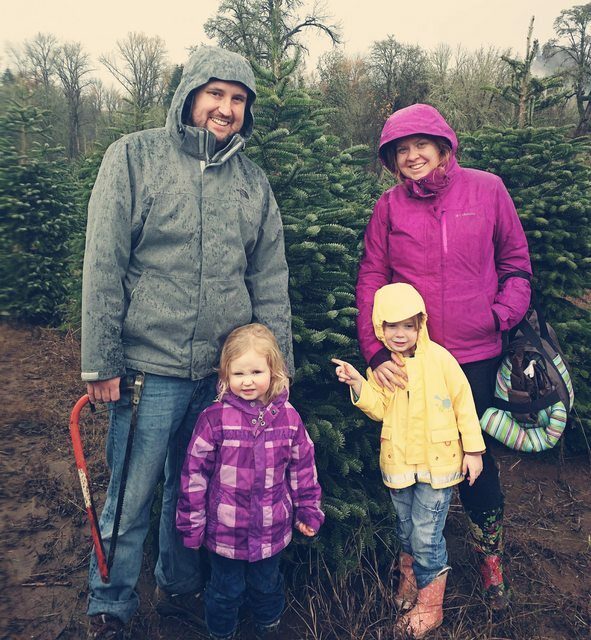 This year we went with Rory and Poppy, and all four kids were (mostly) happy to go say hello. They were a little nervous, but there were absolutely no tears. I’m sure the candy canes helped. 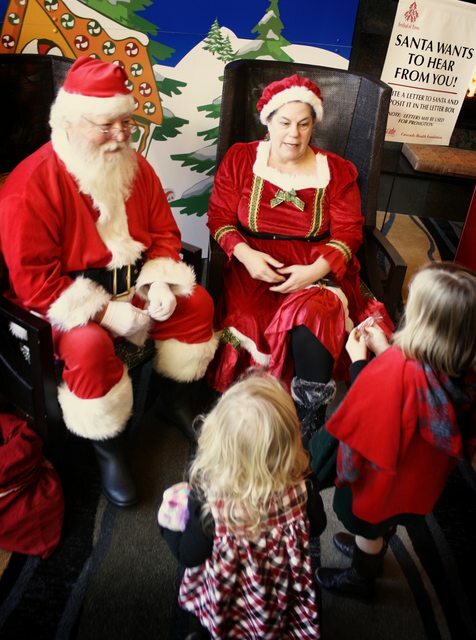 Alma told Santa she wants a unicorn with a glowing horn (anyone have any ideas for this?). Rory told Santa he wants a Poli. 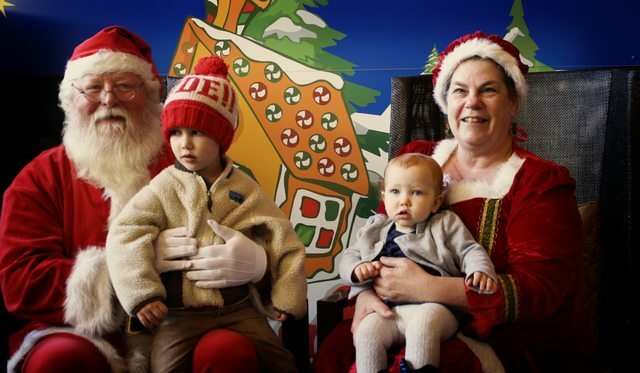 Harriet and Poppy didn’t tell Santa what they want. First of all, please excuse how quiet andthenthey has been. 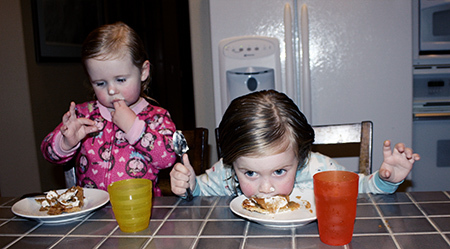 I had grand plans to write a few blogs while we were away for Thanksgiving, but I dropped my phone in the toilet right when we got to our house. It spent the whole weekend in a big bowl of rice, and thankfully has made an almost full recovery. 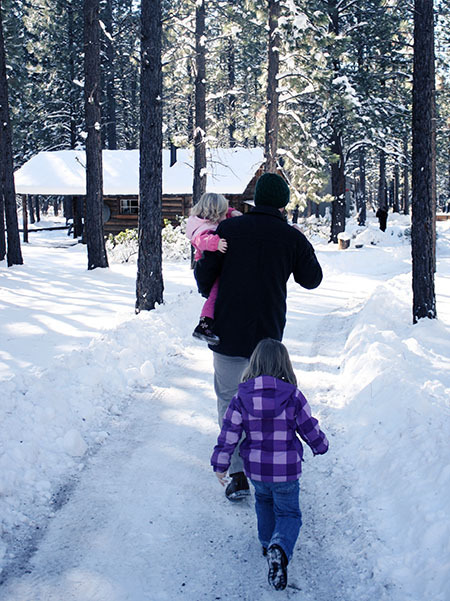 Anyway, we had a wonderful weekend up at Sunriver for Thanksgiving with my Dad and Step-Mom and her brother and family. 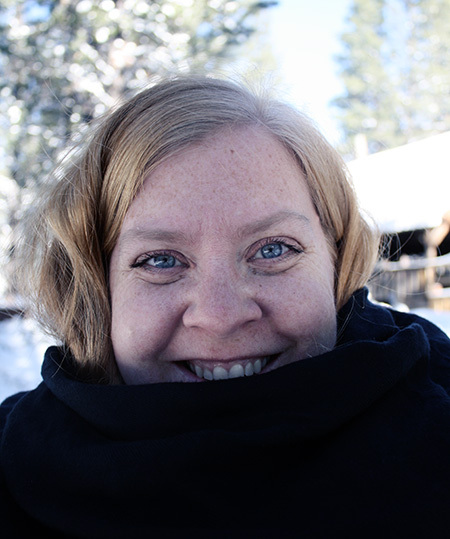 We went up to the mountains on Wednesday, and drove on packed snow from before Willamette Pass all the way to Sunriver. I’ve never seen that much snow, for so long. Luckily, we got to do the drive during the day, so it was sunny and clear. 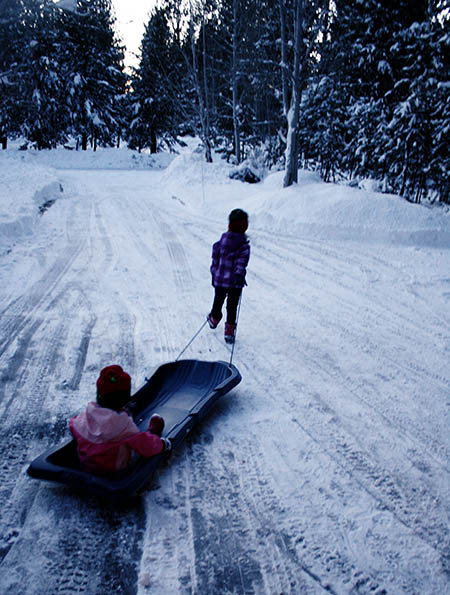 We got to the house in time to play in the snow a little bit before dark. 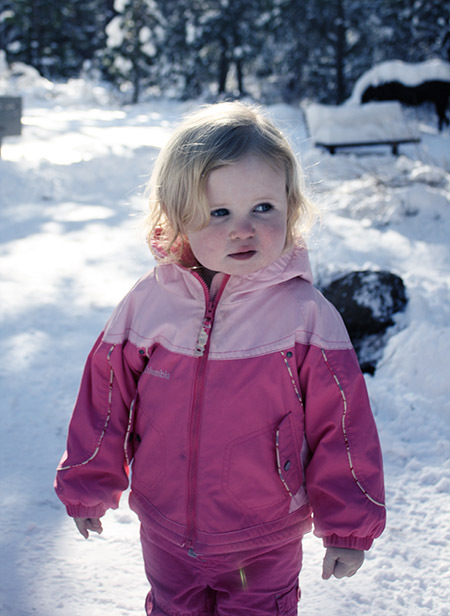 Alma loved it and would have stayed outside longer, despite her cold, wet fingers and legs. The promise of the big bathtub was the only thing that could lure her inside. 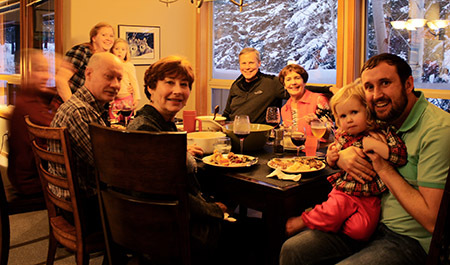 The next morning, Thanksgiving, we went to visit our great friends, the Gosses, in their new home in Bend. It was another snowy, beautiful drive. It was fun to finally get to see their house, and to get to see them! 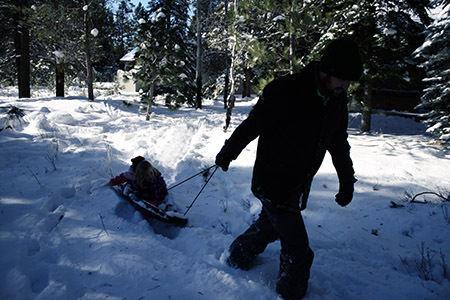 The rest of Thanksgiving was spent playing in the snow, cooking dinner, and eating. I made the turkey this year, and everyone added something to the table. It was wonderful. 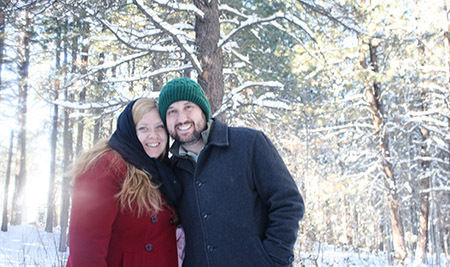 On Friday we braved the below freezing temperatures and went to the High Desert Museum. I love this place so much. It holds so many memories of my childhood. The otters (who weren’t on display), the indoor scenes of the West, the old settler’s cabin and sawmill. It’s all there, all the same, and all incredible. I loved sharing it with the girls. Plus, it was amazingly beautiful in the snow. Alma took this photo of me and Jesse. We went back to the house to watch the Civil War and learn how to knit. Harriet has such a sweet relationship with my dad. He’s certainly one of her favorite people. I’m pretty sure the feeling is mutual. Alma: Rudolph, I saw your friends being mean to you! Alma: Do they let you play with them now? It was sweet to see her so concerned for Rudolph. She has a sweet heart in her, that’s for sure. 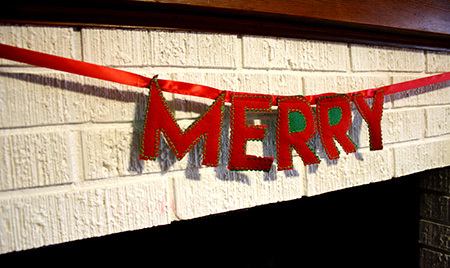 MERRY CHRISTMAS Banner Now on Etsy – Plus Giveaway Winners Announced! 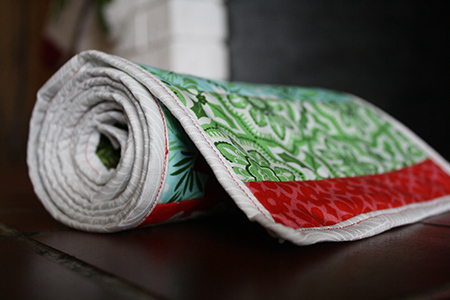 First off, I want to share my new listing on Caro Made Company! 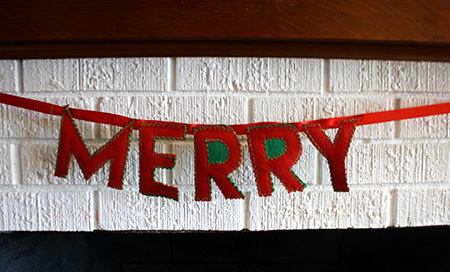 It’s another felt banner – this time Christmas themed. The example I have says ‘MERRY,’ but you can totally customize it. 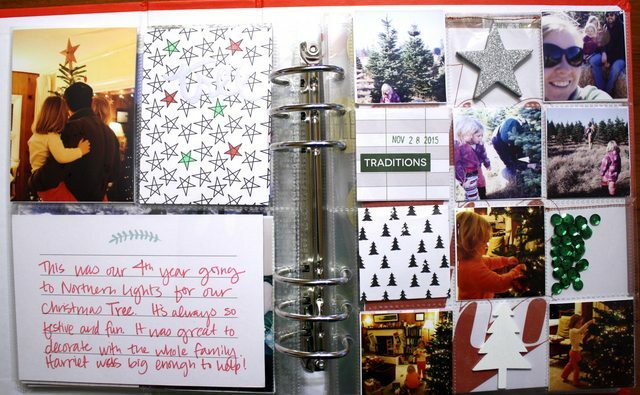 Wouldn’t this be a great way to display Christmas cards or other special mementos? 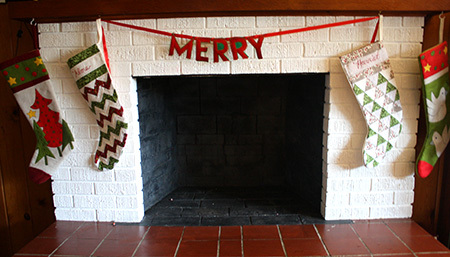 I love how it looks over the fireplace with the stockings. Go check out the listing at Caro Made! Now, on to the winners from last week’s giveaways! Thank you to all who answered my questions and took the time to enter the giveaways! It was fun to spend a whole week sharing these fun items and working with Megan and Katrina. I will send each of you an email, but if you don’t hear from me, please contact me! 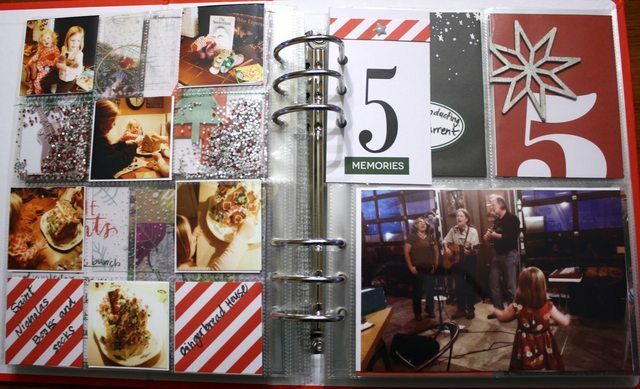 Already to the third day of the 5 Days of Christmas! If you haven’t already entered for the first two giveaways, make sure you go check those out (here and here). The giveaways don’t close until this Sunday night, so you still have plenty of time! For today, I asked my best friend, Katrina, to contribute her talents. She’s always been an artist and an inspiration, but lately she’s been hitting it out of the park with her daily sketches on Instagram. Guys, she’s amazing. Go check her out and like her photos and follow her. Also, you should encourage her to start selling her art. Don’t you think she’d be really successful? Seriously. 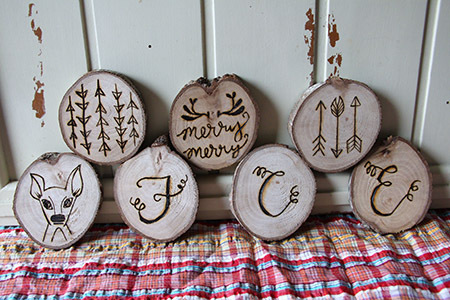 So, now that you’ve gone to her Instagram and are completely impressed, read her tips for using a wood burning tool, and enter to win one of her ornaments! I’ve been making my own Christmas gifts for friends and family members for as long as I can remember. 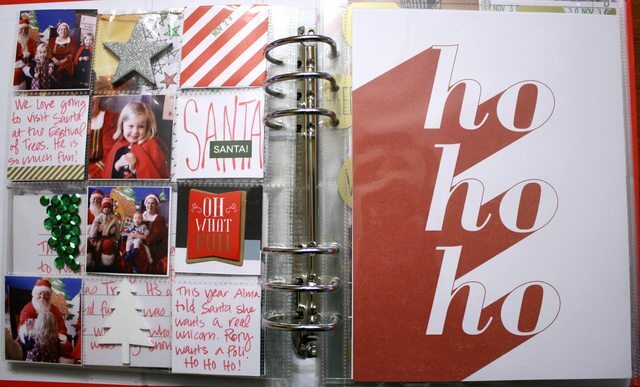 So when Carolyn asked me to participate in her week of Christmas DIY Projects and Giveaways, I was super excited! No hesitation. 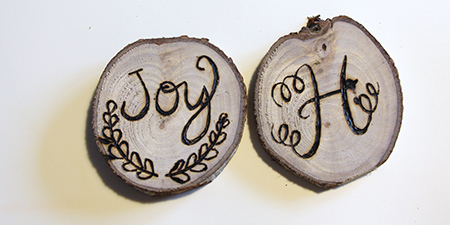 Last year, I made monogrammed ornaments by painting initials on sliced wood circles from branches in my back yard. 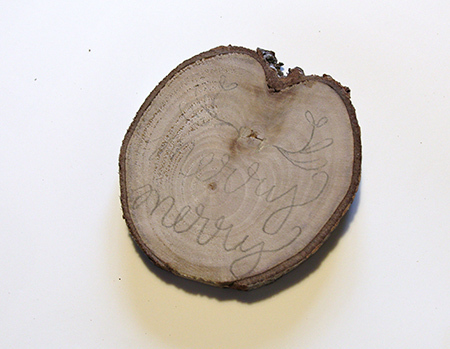 This time around, I tried my hand at wood burning on wood circles using Carolyn’s cool wood burning tool. I have to admit that it took me a few tries to get the hang of it and feel comfortable. I assumed I would like the fine point tip, since I prefer drawing with a fine tip pen. But it took much more effort than I expected to make a smooth line and I ended up making mistakes as I was going back over the lines to add detail. Test out the different tips on a piece of scrap wood (in the same type of wood, if possible) to determine which works best for the project. I preferred the slanted tip. ​Draw the design in pencil on the wood circle. 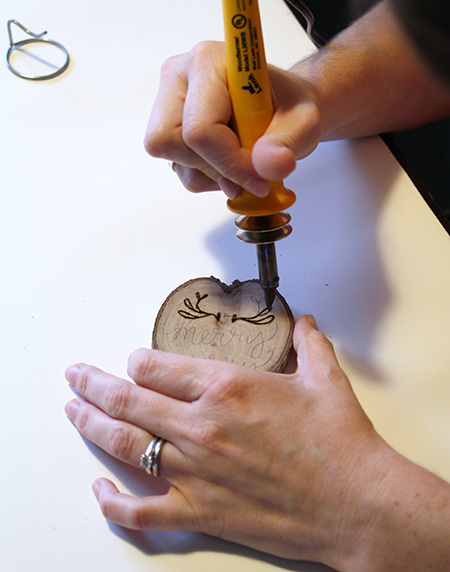 Use my non dominant hand to turn the wood so that I didn’t have to draw with the wood burning tool as much. I still drew with the tool, but felt like I had better control when I also used my left hand to guide the wood circle. Trace over the outline first with the wood burning tool, then go back over to fill in, add detail and shading. Keep the design simple and don’t sweat the imperfections. That’s part of what makes it look authentic and unique. Attach a screw eye to the top (I used a 3/4″) or drill a hole straight through the ornament. 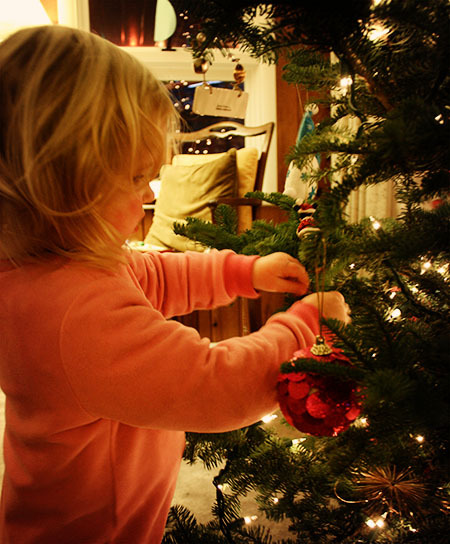 I used baker’s twine, but you can use any ribbon, string or twine to hang your ornament. Giveaway time! 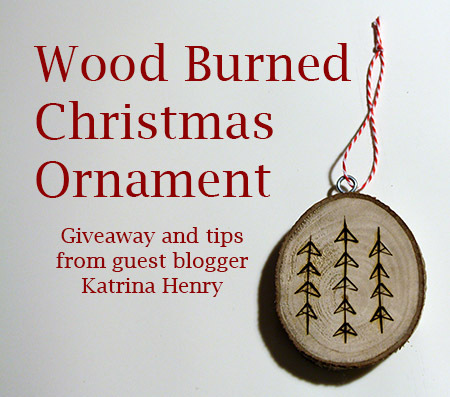 We’re giving away a wood burned ornament. 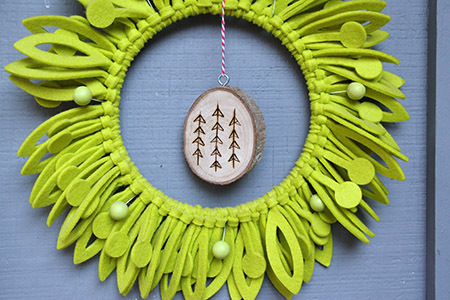 Five ways to enter to win this fun, handmade Christmas decoration. 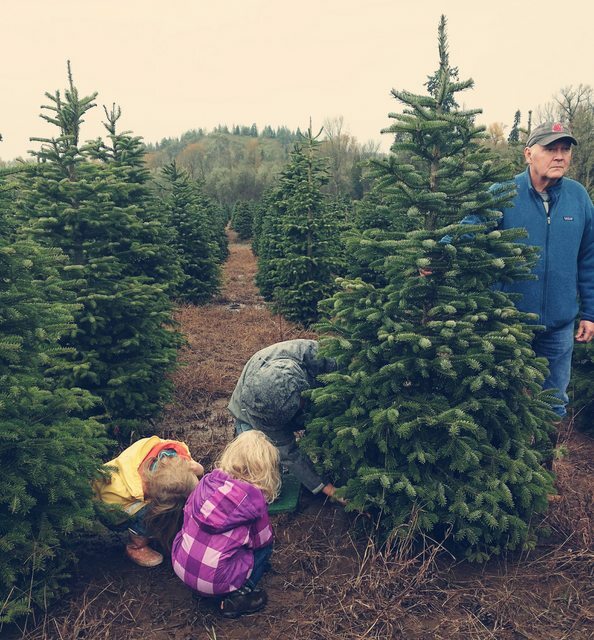 Answer this question in the comment section of my blog: When do you usually start getting ready for Christmas? How do you prepare? Follow me on Instagram (carolynfwilliams), then comment on this blog post telling me you’re following me on Instagram. Comment again telling me you’re following Megan’s shop on Instagram (alwayscreateco). Comment again telling me you’re following Katrina on Instagram (katrinalhenry). Subscribe to Megan’s channel on YouTube. I love wrapping gifts, but I’m so, so bad at it. The ends are always crumpled and there’s way more tape than there should be. I also hate all the trash that we throw away on Christmas morning. But, I love how reusable gift wrapping is getting more popular! I thought I’d make a few gift bags for our family, and show you my process. But first, a story. I have no idea if my parents know this, but my brother and I were expert gift-peekers. 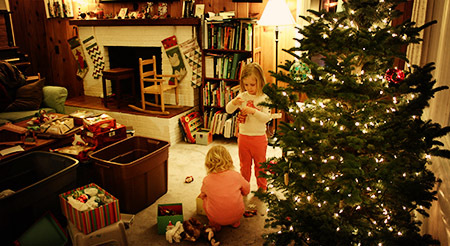 We would shake our presents, lift up the paper, do whatever we could to figure them out. There was one year that I remember, in particular. We would take a knife to slice the tape, carefully unwrap the gift, wrap it back up, then put a new piece of tape exactly over the sliced tape. I think we knew everything we were getting before Christmas was here. That was the year we got new ski pants. I know, it’s odd. Why did we want to ruin the surprise? Now, I would never do that. Why am I telling you this story? Well, because if you have someone like me in your house, these gift bags won’t do much good. You must make these bags with a healthy dose of trust, because they are easy to open, peek in, or completely unwrap. That’s the disclaimer for this tutorial. Well… let’s get started, shall we? 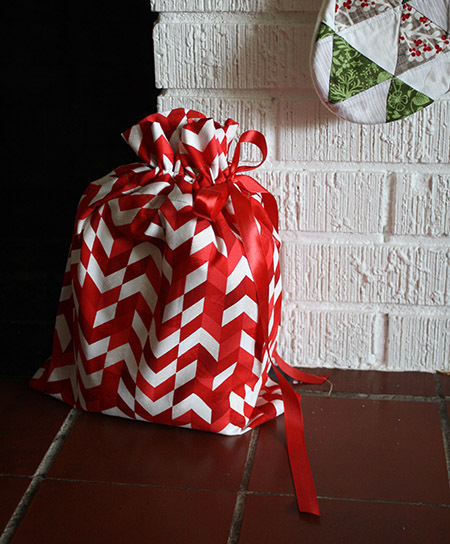 For these gift bags, you don’t need a specific cut of fabric. 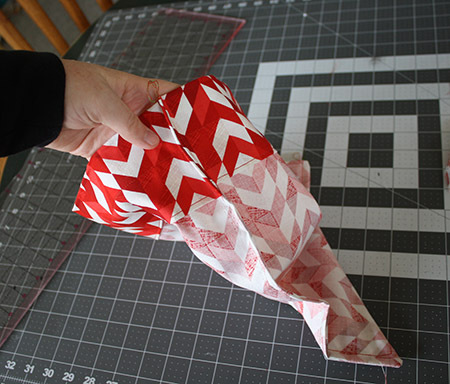 You can really use any dimension, but in this tutorial I used a fat quarter. I like the size bag a fat quarter makes. Start by ironing down about a half inch on the top of the bag. You should note, at this point, that I don’t use actual measurements to make this bag. It’s all estimated and eyeballed. This is partly because the amount of material you use will determine how you construct your gift bag. Also, it doesn’t have to be perfect since it will be all scrunched up in the end. Fold down again, this time a few inches. You can see this in the below photo. If you look to the left of my hand, you’ll see the first fold, then how I folded again on top. Does that make sense? I hope so. Also, in the below photo, you can see two blue marks on the right side of the fabric. These are the guidelines for where I’ll put the buttonhole. The reason I’m doing buttonholes is because it finishes the edges of the holes where we’ll put the ribbon. It adds to the finished look. Unfold the fabric, and put your buttonholes in. (My sewing machine manual had instructions on making a buttonhole, and I’m not sure if the directions would be similar for different machines, so if you don’t know how to make a buttonhole, you should search for your specific machine.) You want to make sure you just put the holes in the top layer of fabric, so be very sure that you unfold your fabric before you start sewing the holes. Refold your fabric and sew along the bottom edge, all along the top. Now, you’re going to finish the channel for the ribbon. 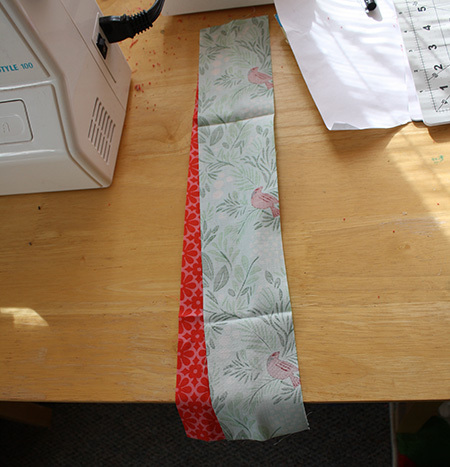 Start above the buttonhole, and sew all the way across the top to make the channel. 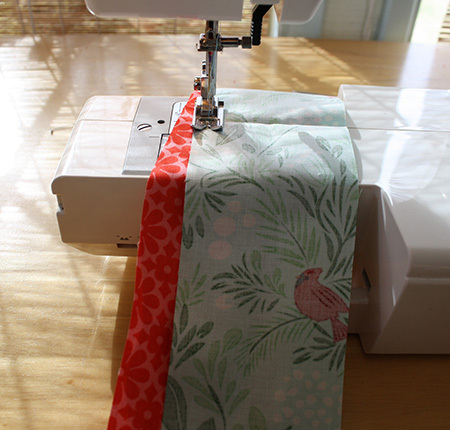 For me, I had a narrow ribbon, so I sewed my second line a couple inches above the bottom line. For these gift bags, I love making it as finished looking as possible, so I like to do a French seam on the inside. 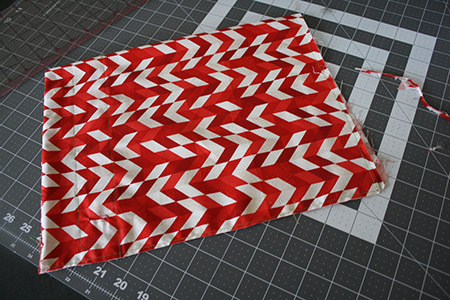 French seams are really fun, and I actually use them a lot when I make clothes, too. Here’s how to do it. Fold your bag in half, wrong sides together. (the photo below is crooked, with the top of the bag on the left side of the photo.) You can see below how I sewed around the bottom and the side opposite the fold. I did about a 1/4 inch seam, but trimmed it to about 1/8 inch. Here you can see the trimmed seams. I also trimmed the corners, so when it’s turned inside out in the next step they weren’t too bulky. 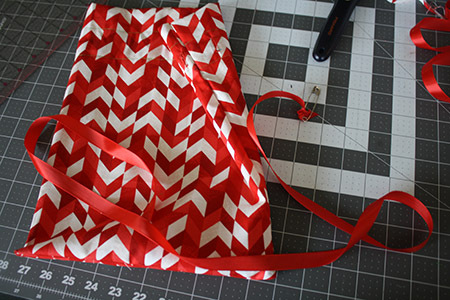 Turn your bag inside out, and sew around the seams you just sewed, again with a 1/4 inch seam. 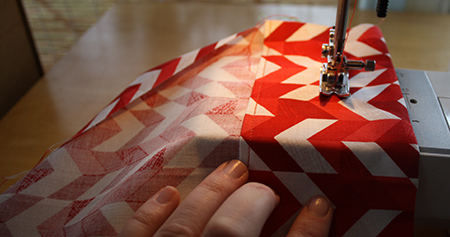 You’ll want to make sure the first seam is nestled inside this seam. Look how pretty and professional! No frayed edges! No sloppy lines! I love it! Now, all you have to do is string your ribbon. Cut your ribbon so it’s about 4 times as long as your bag is wide. I’ve ready about fancy ribbon threading tools, but I’ve always done just fine with the safety pin method. Attach a safety pin to one end, stick it in one of the holes, and work your way around until the pin comes out the other hole, pulling the ribbon with it. Magic! Now all you have to do is make a bunch of these! 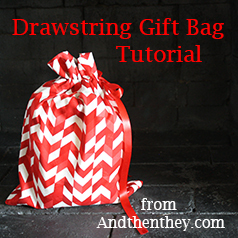 They are quick and easy, so get sewing and you’ll have a stash in no time! They are so fun and cheerful! Make them for hostess gifts (stick a bottle of wine in one as a bonus), birthday presents, or any other occasion. Giveaway time! I’m giving away this festive gift bag. 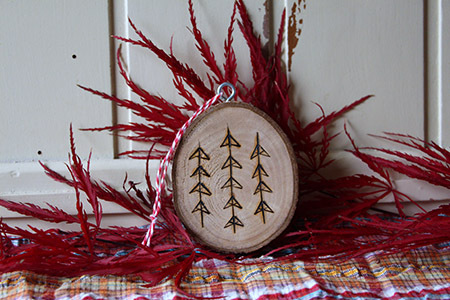 Five ways to enter to win this fun, handmade (read: not perfect) Christmas decoration. You’ll be getting to know the other two sponsors, Megan and Katrina, this week, so you can start following them today! 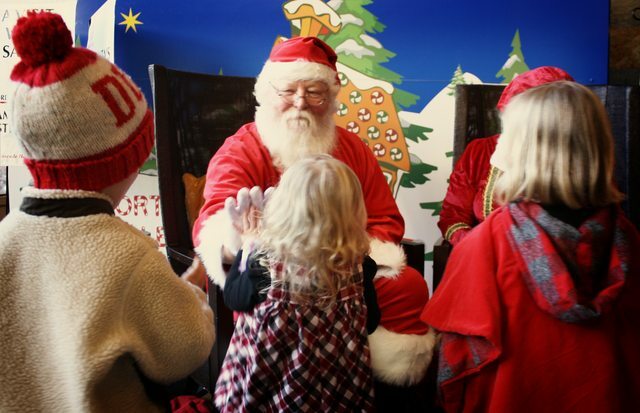 Answer this question in the comment section of my blog: Were you on the naughty list or the nice list when you were a kid? Did you ever peek at your presents? Do you think my parents knew I was such a stealthy sneak? 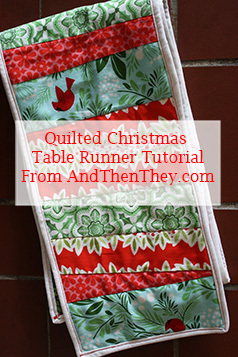 As part of the 5 Days of Christmas Giveaways, I knew I wanted to make a table runner. 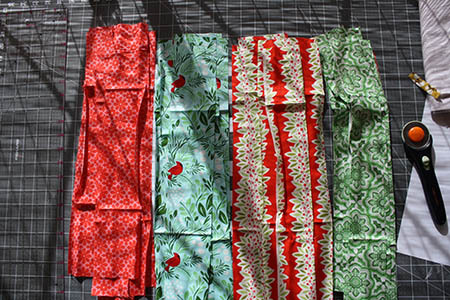 I love quilting and sewing and Christmas and tables, so it was an obvious choice. 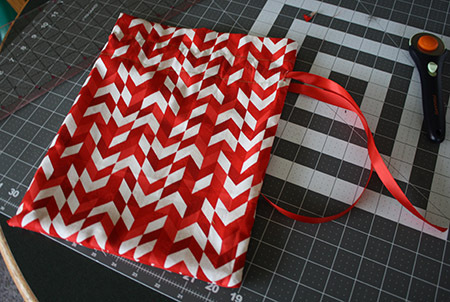 This project is perfect for someone who’s new to sewing. 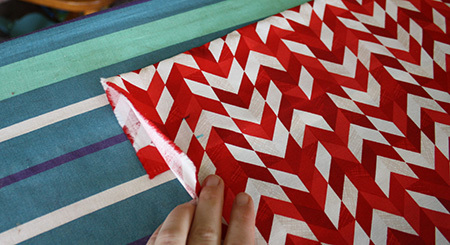 If you’ve been wanting to make a quilt, this is a great place to start. 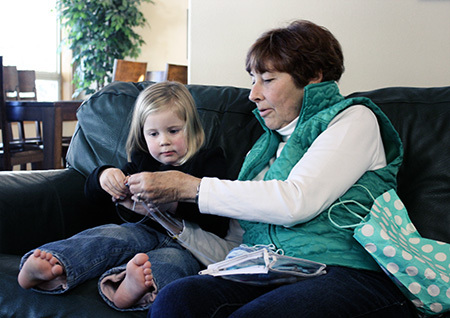 It has all the elements of quilt-making, but on a much smaller scale. That means that you can learn the methods without the overwhelming amount of fabric or work. It’s also very forgiving – the way I did the crooked strips mean that you don’t have to worry about having things line up, or even about sewing a straight line. Iron Disclaimer: This is my first sewing tutorial, so I’m sorry if something’s unclear. Please let me know if you have questions, or if something needs to be clarified! 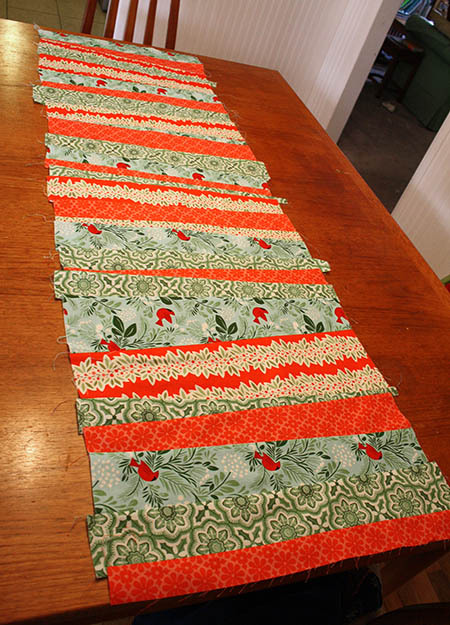 I started with four fat quarters and cut them into strips. I didn’t measure anything because I was going for the uneven, crooked stripey look. I did some wide strips, and some narrow strips, but most were in between. I probably should have ironed my material, but this wasn’t about perfection, so I didn’t. 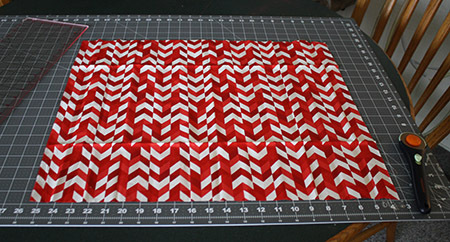 Above, you can see the first two strips ready to be sewn. 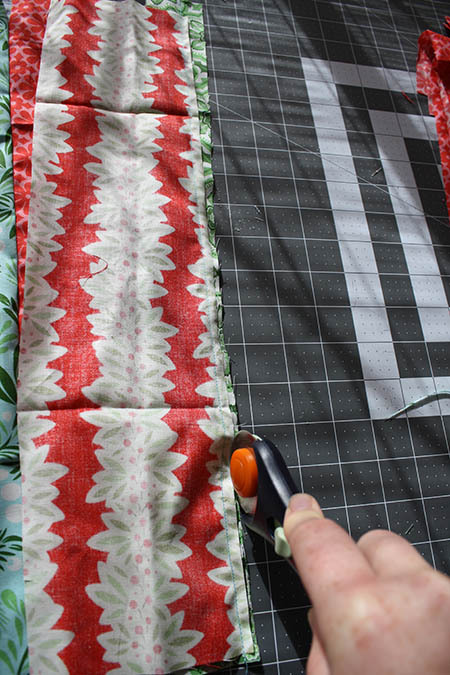 If you were doing a quilt where you wanted straight lines, and lined up angles, you would just put the two pieces together (right sides facing), and sew along one edge. To get the crooked look, I just placed my strips together (right sides facing), but didn’t line up the edges. When you sew the strips together, follow one edge. I like to use a 1/4 inch seam, so I just line the edge of the fabric up with the edge of the sewing machine foot, and that’s a little over 1/4 inch. After you sew a new strip on, go ahead and trim off the extra seam allowances, making both pieces of fabric have about a 1/4 inch seam. You can see in the photo above how the red fabric won’t be trimmed much, but the green fabric will have quite a bit trimmed off, especially near the top. Above, you can see one of the strips that I made really crooked. Can you see how that top fabric is placed at quite an angle from the one I sewed it to? That meant that I trimmed of quite a bit of the bottom fabric, but it created a really crooked line. Just keep adding strips until you run out, and it should be fairly large. 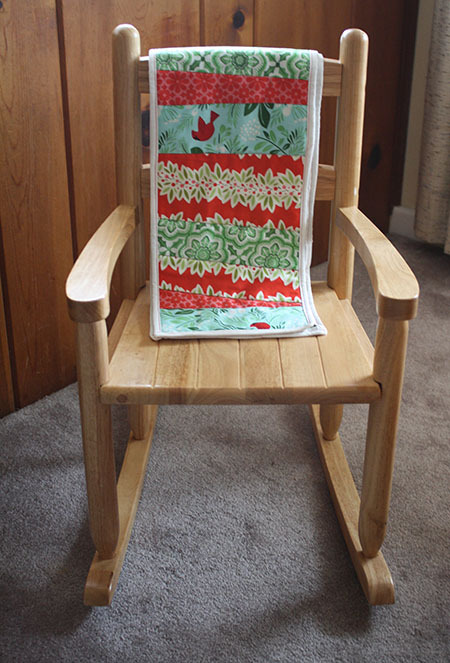 I don’t have a photo of this, but after I sewed all the strips together, I ironed the quilt top. I pressed all the seam allowances in one direction and got rid of all the creases. 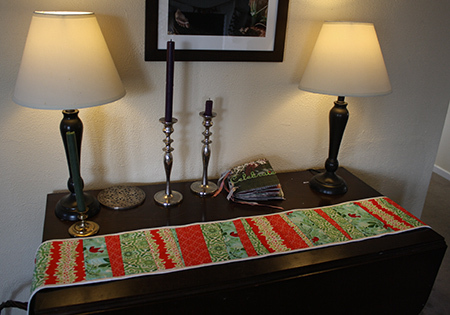 I also cut the whole thing in half, to make two long, narrow table runners. I think this would look great if you kept it wide, too! Totally your choice! Now, on to the quilting! I cut out some fabric for the backing. It wasn’t long enough, so I had to sew two pieces together. Lay your backing fabric (design side down) on a large work area. For big quilts, I do this on the floor, but for this project, my dining room table worked just fine. Smooth it out and place your quilt batting on top. 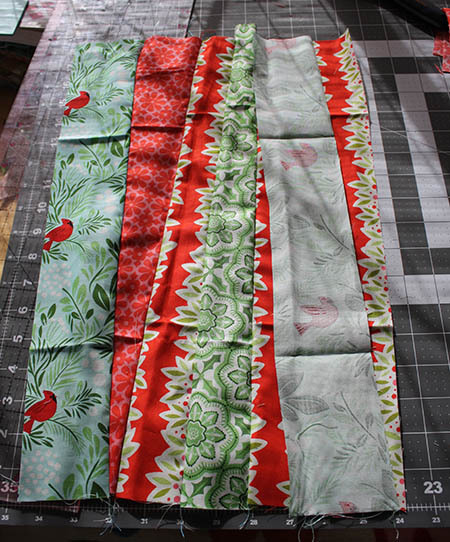 Then, put your quilt top on top, sandwiching the batting between the backing and top. Smooth it all out, check to make sure it’s all lined up, and stick some pins in it. Next, roll it up from both sides, to the middle. It’s helpful to clamp these rolls, just to keep everything snug in place. I found that it wasn’t as necessary for this project, since it’s so small, but you might still find it helpful. 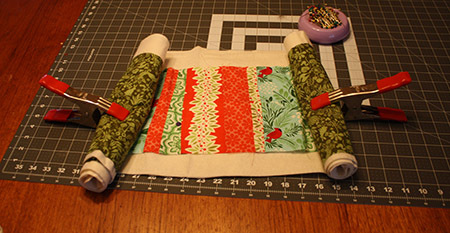 The purpose of quilting is to hold the three layers all together. I have yet to get too fancy with my quilting. I usually just do straight or wavy lines, and I like how that turns out. For this quilt, I didn’t really want to see the lines, so I used a technique called stitch in the ditch. Basically, this means that you will sew right over the seams. The quilting lines are almost hidden in the seams. 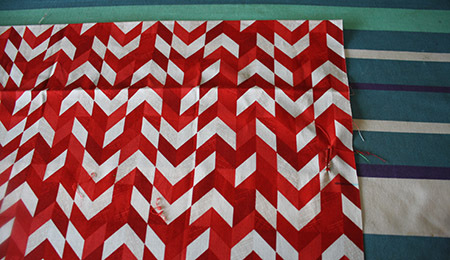 I used red thread, so it stands out more than if I had really been trying to match, and hide the quilting lines. 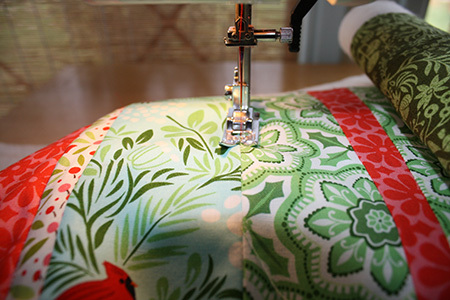 Keep quilting until it’s all sewn together! To bind it, use this tutorial. 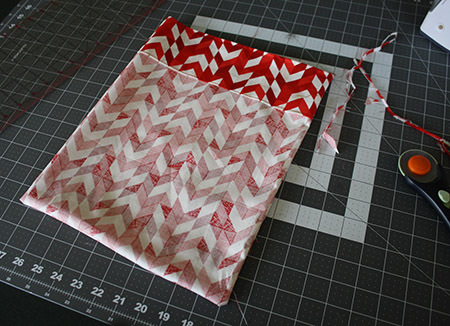 I started writing a tutorial for binding, but realized that this one is way, way better. It’s what I used to learn, and I look back at it every time I make a quilt. The only thing I do differently is how I finish it. I usually attach it first to the back of the quilt, then use my machine on the front with it folded over. 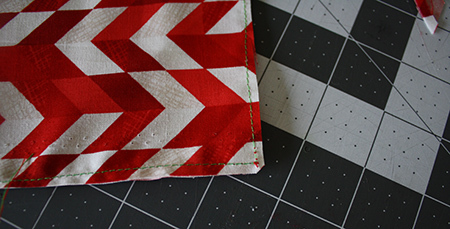 This means that the front of the binding has a line of sewing on it, but I like that look – especially on this quilt with the red stitching on the white binding. It’s also much more secure, and since most of my quilts have been for kids and babies, that’s important. My quilts get washed a lot and need to hold up. Please let me know if you have any questions! I’m happy to help! Let me know if you end up making one of these – I’d love to see it! Giveaway time! I’m giving away one of the table runners I’ve made here (the backing fabric is different than the one pictured, so that will be a fun surprise!). 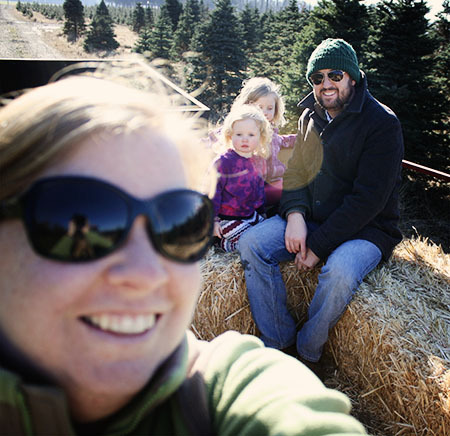 Five ways to enter to win this fun, handmade (read: not perfect) Christmas decoration. You’ll be getting to know the other two sponsors, Megan and Katrina, this week, so you can start following them today! 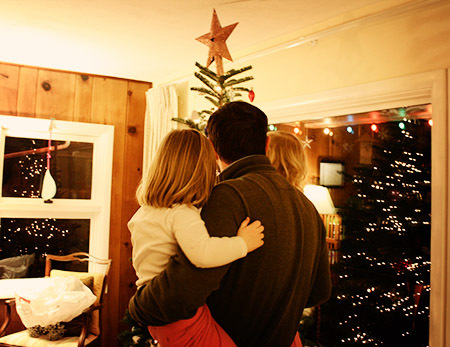 Answer this question in the comment section of my blog: What is your favorite Christmas decoration? Does it have a story? Is it an heirloom or something you bought more recently?